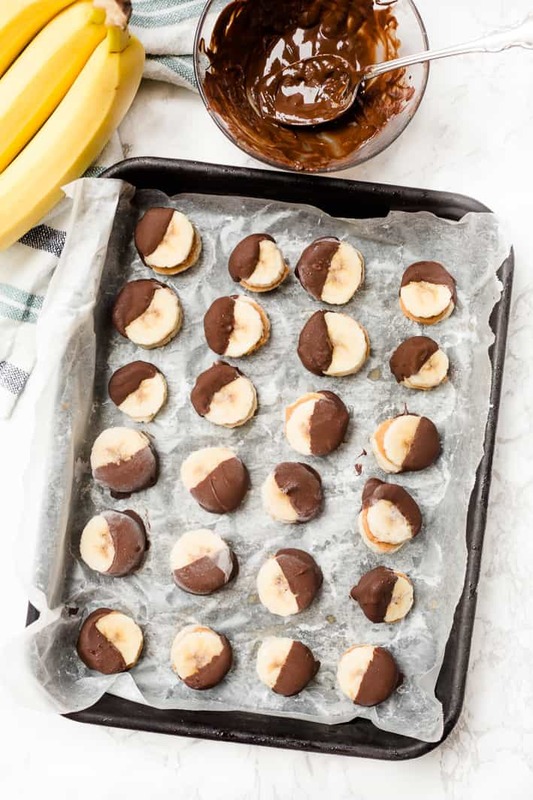 These frozen chocolate peanut butter banana bites couldn’t be simpler to make, and they’re the perfect mini treat for your sweet tooth! Phew, it has been a while since I’ve last shared a recipe, and I apologize for leaving you hanging! I had spring break (which you may’ve seen on my Instagram stories! ), and I’ve been working on planning a summer trip or two, looking for a summer job, enjoying lots of time with friends for my senior year, finalizing law school plans for next year, and tying up the loose ends for my thesis this semester…but I’m back and so excited to share these frozen chocolate peanut butter banana bites with you! I almost always (okay, always) love having a little treat after lunch and dinner. It’s usually not because I’m hungry, but just because I’m craving something sweet. I’m sure my taste buds would be happy to have ice cream after every meal, but I try to not overdo it on the ice cream and only eat it sometimes, so I love coming up with other ideas for mini treats, especially ones that are naturally sweetened. Some of my favorites are dried figs, fresh fruit, a square of dark chocolate, or an energy bite. 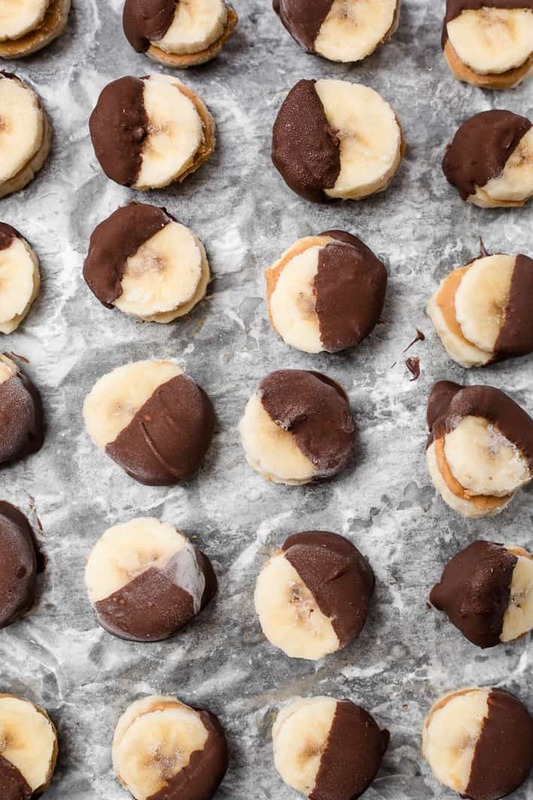 Then, there are also these frozen chocolate peanut butter banana bites. I love making these because they’re small and rich, and just one or two feels like the perfect amount. And they satisfy my ever-present chocolate and peanut butter cravings. And they couldn’t be much simpler. Just cut a few bananas into small coins (the thinner the better, at least to a reasonable extent!). Then, spread natural peanut butter in between each set of banana slices. Place ’em on a parchment or wax paper-lined tray or baking sheet. Pop them in the freezer for a couple of hours. Then, once they’re frozen solid, melt semi-sweet or dark chocolate chips with a bit of coconut oil. You can’t taste the coconut at all, but you can also sub another oil with a fairly neutral taste if you don’t have coconut oil. The oil helps the chocolate chips melt smoothly and coat the banana slices in a thinner layer. Working quickly, you’ll dip half of each “sandwich” in melted chocolate and place them back on the baking sheet or tray and put them back in the freezer ASAP. A couple of hours later, they’re all ready to enjoy! These are so cute and I found myself thinking, “These would be so fun to make for kids. Wait, whose kids? 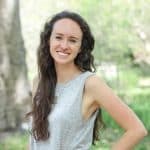 You are a 22-year old college student!! !” So, I’ll file this in my “future cool aunt” and “fun babysitter” recipe file, along with my favorite peanut butter crispy treats and energy bites. And I’ll tell my sister to have some kids ASAP. Until then, I’ll keep making these peanut butter banana bites for myself! 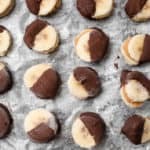 If you try these frozen chocolate peanut butter banana bites, let me know in a comment or take a photo and tag me @livbane on Instagram– I’d love to see! 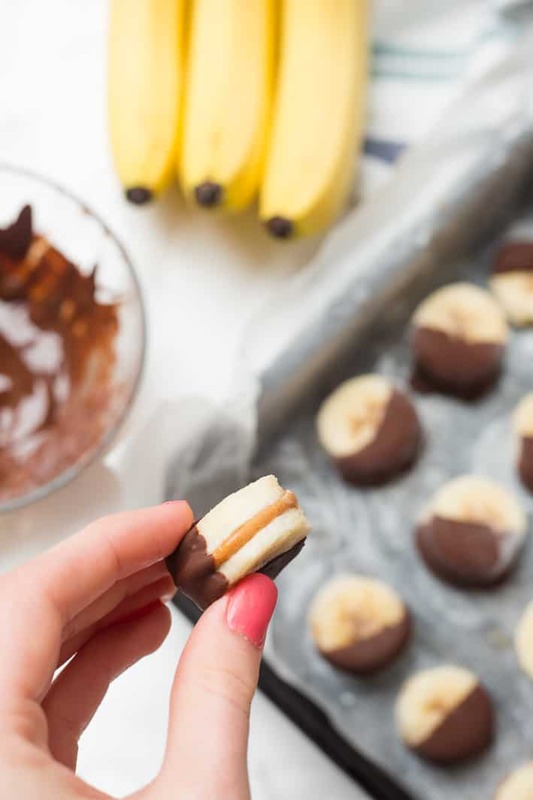 These frozen chocolate peanut butter banana bites couldn't be simpler to make, and they're the perfect mini treat for your sweet tooth! Place a sheet of wax or parchment paper on baking dish or small tray. Peel bananas and slice into small coins, about 1/4 inch thick. Using a small knife, spread 1/2 tsp. peanut butter on each of half of the banana slices. Place another banana slice on top of each peanut butter-covered slice to create a "sandwich." 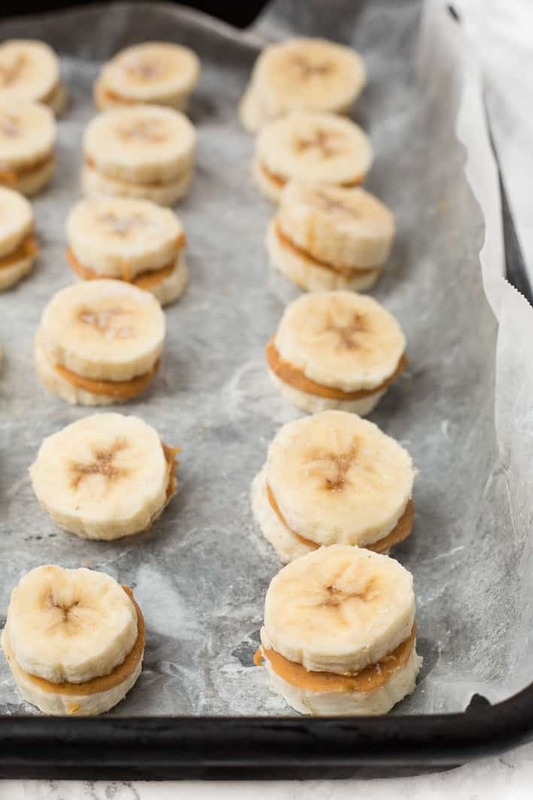 Place banana "sandwiches" on the baking sheet or tray and put in the freezer for at least 3 hours. 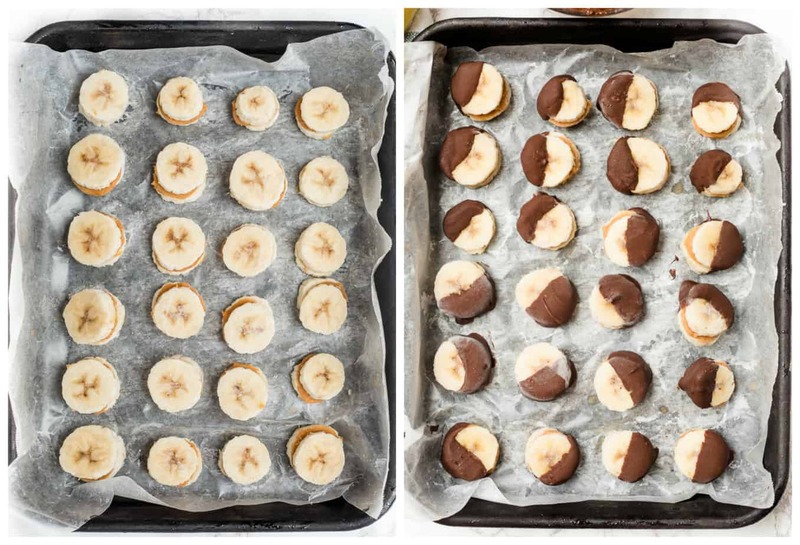 Once bananas are frozen solid, prepare the chocolate coating. Place chocolate chips and coconut oil in a small bowl and microwave on medium-high heat for 30 seconds and then stir. Microwave again for 15 seconds and stir. If needed, microwave once more for 15 minutes and stir to fully melt chips. Remove bananas from freezer and working quickly, hold each banana sandwich and dip half of it in the bowl of melted chocolate. Place back on baking sheet or tray and return to freezer for 2 hours until frozen solid again. Enjoy! I love these! A healthy way to satisfy my sweet tooth, too! Hi Michelle, I haven’t used strawberries but you certainly could try! I’d cut the strawberries at least in half since they’re so hard once frozen. Absolute perfect mini snack idea! Love that I usually have all of these on hand too. So delicious! And a great way to use up bananas! I tried some without chocolate and it was pretty good too! Yeah I’m so glad you like them!! Thanks, Alyssa!! I hope you love them! Yes!! So cute and totally fun for kids 🙂 Can’t wait for you to try them!